Due to national shortages there may be an estimated 5-10 day lead time on Acoustic Mineral Wool orders. 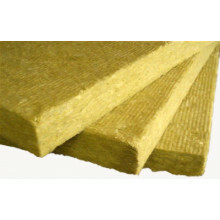 This acoustic mineral wool (AMW) is particularly useful as a sound absorbing infill for the reduction of airborne noise in partition walls, between flooring joists and suspended ceilings. AMW consists mainly of silicon-oxide together with a number of other metallic oxides. It is FAR MORE efficient for soundproofing purposes than lightweight thermal fibreglass loft insulation which should not be used in place of high density acoustic grade mineral wool. It is non-flammable and chemically inert and is not adversely affected by any substance it may normally come into contact with. Random arrangement of fibres ensures no water penetration in any direction. It is rot proof, non-hygroscopic, does not sustain vermin and will not encourage the growth of fungi, moulds or bacteria. It will not react with wired plastic or metal wall ties, brickwork or masonry. Our 60kg/m³ is a performance acoustic grade version. Our 45kg/m³ is a standard lesser performing lighter version. We also offer a 140kg³ slab for specialist applications. If you want to upgrade a ceiling to one-hour fire resistance without adding any extra plasterboard to the ceiling, then you can use rabbit wire mesh to hold the mineral wool between the joists to meet this requirement. The combination of the secured mineral wool sitting on the wire mesh, and the existing ceiling, is usually accepted by Building Control as being in compliance with the required fire resistance of a separating floor between flats. Usually the material is friction fitted tightly between the joists so you won't need any if working from above. However, it is sometimes useful to use it if working from below to prevent the material dropping back down before the plasterboard and bars are fitted. Slabs manufactured to a higher density than 60kg/m³ are often referred to as Dense Fibre Matting or DFM. They can provide slightly improved acoustic control and come in 100kg/m³ and 140kg/m³ densities. This product costs approx. twice that of our 60kg version and should only really be considered for specialist applications as double the cost does not give twice the acoustic performance. Thicknesses of 30, 40 and 60mm are also available subject to 5pack min. order. b) the width of the joist or frame. The larger the area to be treated the fewer packs you will need: for a small area there will be little difference, but when you get to 100m² plus it will pay to make accurate calculations. As a generalisation, assuming the width of a frame to be 50mm at 600mm spacings, you would have approx. 8% in excess.